Brief blog today, for I’m enjoying my leisure time at Lake McQueeney. I’ve joined my friends Joe and Becky at their lakehouse. Their two daughters and their friends (down for spring break from University of Texas and Southern Methodist University) have entertained us adults. Slideshow is available by clicking on the photo below. 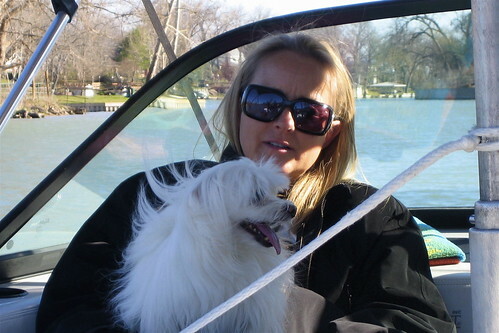 Max has that carefree wind-in-hair look as he enjoys the boat ride on Becky’s lap. A lovely cottage with a view of Lake McQueeney was the gathering place for the Fourth Annual Lakehouse Weekend (week of Fourth of July) which actually has lengthened to a week for some of the participants…and we owe it all to Max, the Maltese that I keep whenever his family travels. Usually we have a cottage right on the lake, but as long as we have dock access, we’re happy weekenders. Past participants have come from Houston, Ft. Worth, Oklahoma City, Indianapolis, and Orlando. I’ll share more of our antics later. 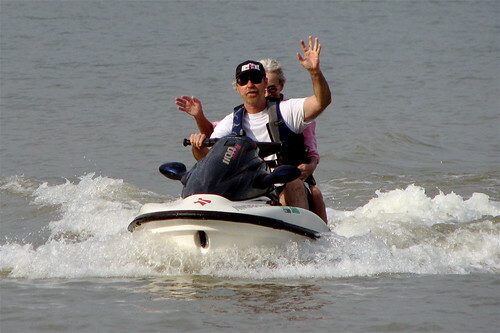 Russ takes Doris for a ride on the sea doo on Lake McQueeney in July. Click on the photo to see more Lakehouse Weekend, 2007 photos.